Everyone knows the highlights of Palmer’s sports career, but how many aviators do you know who soloed in six hours? That’s not a typo. I’m fairly certain I was still trying to figure out how to start the engine properly at the six hour mark (some might argue that I’m still working on it 8,000 hours later… but that’s a topic for another time). If my CFI had tried to cut me loose at that point – not that there was any danger of this actually happening, mind you — I would have been the one pulling on his shirt tail as I hauled him back into the cockpit. What’s the old saying? “A man’s got to know his limitations”. Palmer was a quick study in many aspects of life beyond sports and business. But it’s clear he also had a major passion for flying airplanes. 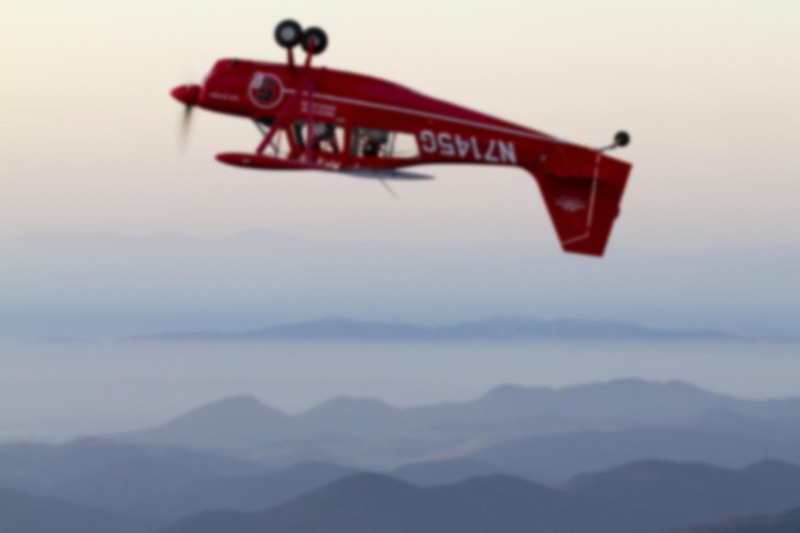 How many aviators have set world speed records circumnavigating the Earth? Or flown actively for more than 56 continuous years? 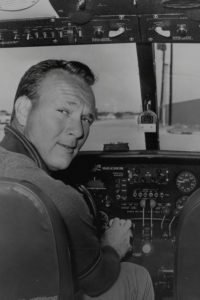 Arnold Palmer at the controls of his Aero Commander twin. What I love most about this statistic is that it tells a love story. Arnold Palmer didn’t need to fly the airplane in order to reap the benefits – at least, not after the business aviation field got established. If he’d simply wanted to get from place to place, he could’ve easily occupied a seat in the back of the plane and had someone else do the flying. That’s what most high net worth individuals do. As most of you know, flying an aircraft – even if you love it – can be a tiring activity. When he got to wherever it was he was going, Arnie didn’t go to the hotel room and call it a day. He got to work playing golf, designing courses, making deals, and doing whatever business was before him. The depth of experience in his logbook indicates someone who had a passion for flight which went far beyond the financial and business benefits it engendered. How can you not love a guy like that? Arnold Palmer was proof of that business aviation pays dividends. While this may be self-evident to anyone who takes an honest look at it today, he was using aviation to further his business in the mid-late 1950’s. It was almost unheard of back then. The business aviation industry didn’t really exist yet. The first Learjet flew in 1963. Even Grumman’s famous Gulfstream turboprop, one of the first serious purpose-built business aircraft, didn’t begin deliveries until about 1960. Well, just when I thought I was going to read a eulogy to Bob Hoover! But as you say, there are plenty of big names in aviation – and then there are plenty of great names. For my money, greatness is in the eye of the beholder, and the cost of membership only needs to be an inspiring love of aviation. Collectively, we rise up on collective greats like Arnold Palmer, and personal greats like the ex-RAAF CFI who poured a lifetime of unwritten experience into me during my Unusual Attitude training. Cool post. Threw ya off there, did I? 🙂 You’re right, there are many big fish in the aviation sea, and the top of the pyramid is probably occupied by different people for each of us. The fact that your summit is populated by someone most of us have never heard of is wonderful, because it demonstrates that one needn’t be part of the flying glitterati to have a life-changing impact on others. It requires only effort, a little caring, and the gift of time. Absolutely! And better still, there’s plenty of room at the top. Nice tribute to Arnie. He truly was one of a kind. I was a controller at Cleveland Center for 30 years and talked to him many times as he flew in and out of Latrobe, PA. He treated controllers like brothers and here is a little know fact about that. Arnie invited all the controllers at Cleveland to come to Latrobe and play golf, any time, without notice or prior arrangement. He said, “just come on down and when you get here tell the guys in the pro shop you’re from Cleveland Center and they will let you play.” If Arnie happened to be there he would personally greet you. I’m sure he extended this invite to many others in the aviation business, as he felt we were all a band of brothers. He was quite a guy and his legacy will live on. What a great story, John. It makes total sense, too, especially since he flew single-pilot for much of his career. My cousin was an air traffic controller, and as a pilot who’s been bailed out by them more than once, I both understand and appreciate Arnie’s generosity toward the folks on the other end of the radio. I’ve witnessed gestures of this kind over and over again from people in the industry. Just makes the whole thing that much sweeter to know each of us is recognized and appreciated for what we do. When I garnered my Learjet type rating in 1972, knowing Arnie had his own jet, I sent him a resume and received a very pleasant response with a letter thanking me for my interest. It was signed by Arnie. That’s a very telling gesture, especially when you consider that he did that during what was probably the height of his career. Today these “signed” letters are just as often stamped or done with an autopen, but in the early 70s seeing a handwritten signature on the page meant something. Great post…he was a stud on the Links and in the Air! Arnie was a true Gentleman.